Support for high-speed Optane memory could be Intel's edge over AMD's impressive Ryzen chips. After launching its first dual-core “Kaby Lake” chips for ultrathin notebooks in August, the floodgates have opened. At CES in Las Vegas on Tuesday, Intel announced it's now shipping 40 different Kaby Lake quad-core processors, for products ranging from tiny Compute Sticks to performance laptops and desktop PCs. With the first Kaby Lake reviews already in the can, you might think that that’s all one can say about the new chips. 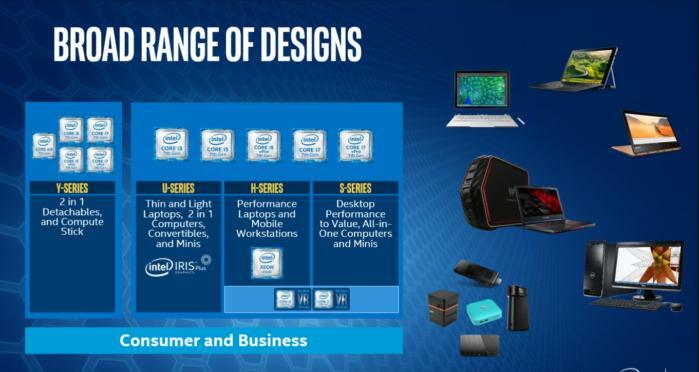 But Intel executives say that—whoa!—the new processors will also support Intel’s revolutionary 3D XPoint or “Optane” memory, a super-SSD “that will make a system faster with very limited tradeoffs from a system perspective,” according to Karen Regis, director of mobile platform marketing at Intel. From a performance standpoint, Intel expects the new chips to perform 20 percent better than the old quad-core Broadwell Core chips of 2013, using the standard SYSmark 2014 benchmark. Video, though, remains one of Kaby Lake’s strengths. The integrated hardware video accelerator within Kaby Lake that Intel discussed previously will boost 4K video creation capabilities by up to 65 percent compared to the Broadwell chips, and playback will be accelerated as well. Optane adds a new, unexpected wrinkle. Who’s going to build Optane memory? What will it cost? What performance benefits will it actually deliver? Should I hold off on buying memory, and save up for Optane instead? All these details remain tantalizingly just out of reach. And, of course, the other major question is about the effect of AMD’s Ryzen: How, if at all, will it shake up Intel’s pricing strategy? Intel is launching more than 40 of its “Kaby Lake” Core chips, for tiny compute sticks all the way up to performance desktops. To recap: in August, Intel launched the dual-core 4.5-watt Y-series and 15W U-series Kaby Lake chips, for ultra-low-power 2-in-1s, 2-in-1 convertibles, and ultrabook clamshell PCs. Those families also now include a 15W vPro U-series version for corporate PCs and a 28W U-series chip. Dual- and quad-core H-series chips (45W) for both large clamshells and VR-capable notebooks. Unlocked versions are included, as are vPro derivatives. Base clock speeds range from 2.5GHz to 3.1GHz, with turbo-boosted speeds up to 4.1GHz. Prices range from $225 to $568 in 1,000-unit lots; expect retail prices to be a bit higher. 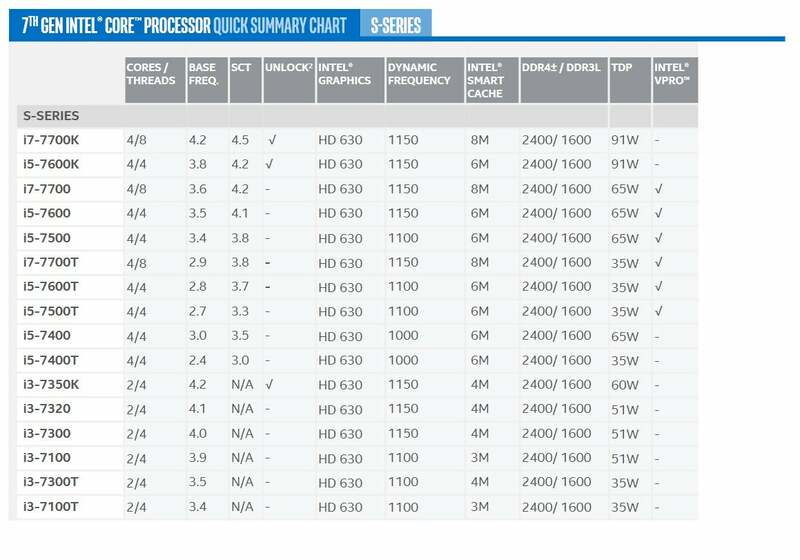 Dual- and quad-core S-series chips (35W, 65W, 95W) for mainstream desktop tower PCs, including vPro. The 35W chips can be also used for all-in-ones and mini PCs, while the 65W and 95W series are designed for enthusiast PCs, including unlocked versions. Base clock speeds range from 2.4GHz to 4.2GHz, with boosted clocks up to 4.5GHz. Prices range from $117 to $339. Quad-core mobile Xeon chips for mobile workstations. Base clock speeds range from 3GHz to 3.1GHz, with boosted clocks up to 4.2GHz. Eight new chipsets: five (the Q270, Q250, Z270, H270 and B250) for desktops, and three (the CM238, HM175 and QM175) for mobile PCs. All of the 200-series chips are Optane-ready, and they include four extra PCI Express lanes. Even that summary doesn’t tell the whole story, of course. If AMD’s Ryzen delivers on its promises, Intel may have to adjust its premium pricing downward. 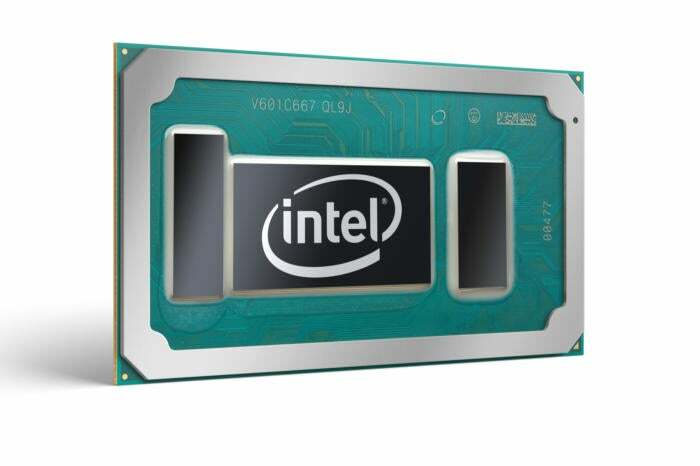 Intel’s 4.2GHz quad-core i7-7700K 91W desktop chip is priced at $339, but it’s the i7-7920HQ 45W H-series chip for notebooks that commands the premium $568. The probable reason: AMD won’t deliver its Raven Ridge notebook chips based on Ryzen until the second half of 2017. 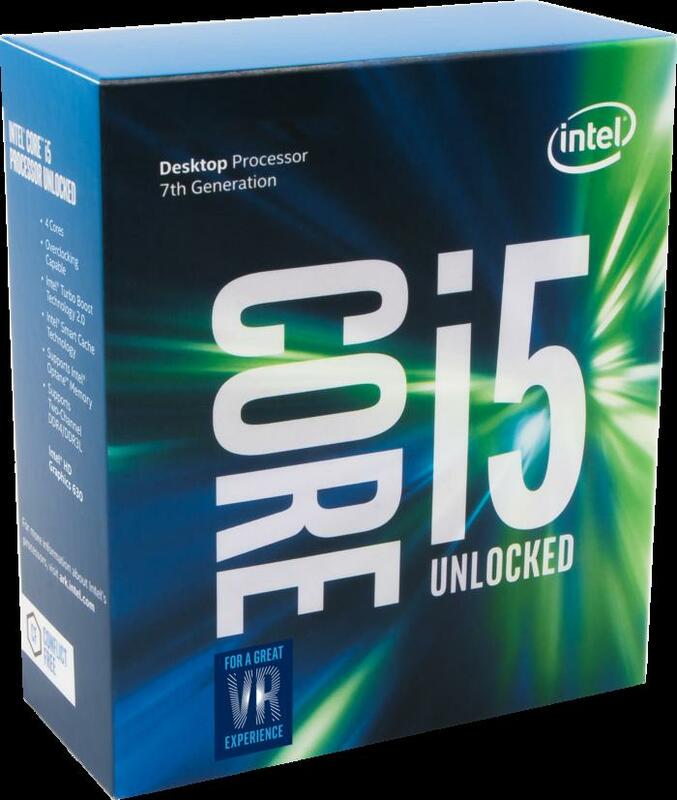 In the continued absence of true competition, Intel is free to price its processors as it wishes. 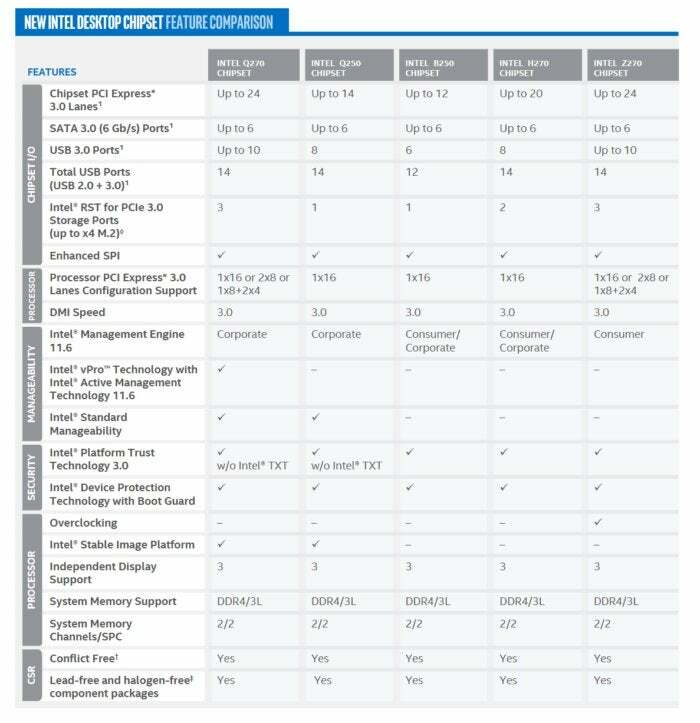 Note that Intel is breaking out its single- (SCT) dual- (DCT) and quad- (QCT) core turbo boosted speeds. Because the majority of legacy PC games run on a single core, the single-core boost score is the most significant. But the other numbers also show how better-coded, multithreaded games will run in an overclocked state. Note, too, that Intel is playing it a little cagey with its S-series chips—thus the lack of detail in the boost speeds. That’s the Ryzen effect too, apparently—though Intel executives declined to comment on AMD’s chip. 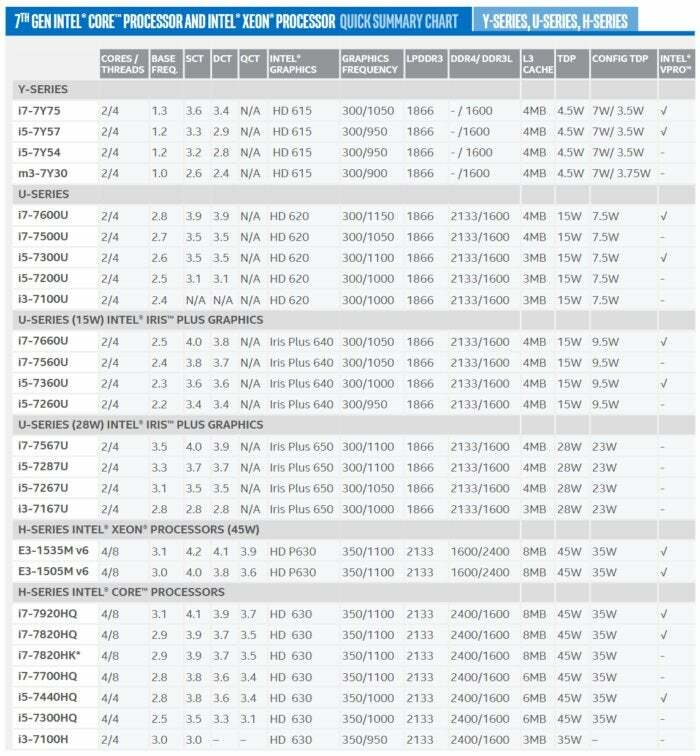 You may notice one other change from Intel’s charts above: Intel’s Iris Pro integrated graphics is gone, replaced by a new brand, “Iris Plus.” Intel believes Iris Plus will deliver a 65-percent improvement in 3D graphics (measured by the 3DMark Sky Diver benchmark) and a 40-percent improvement in video conversion (in TouchXPRT 2014) over the current HD Graphics integrated cores that make up the bulk of Intel’s chips. Basically, think of Iris Plus as the upgrade that will help propel Kaby Lake systems into 1080p gaming at lower quality levels, according to Intel. 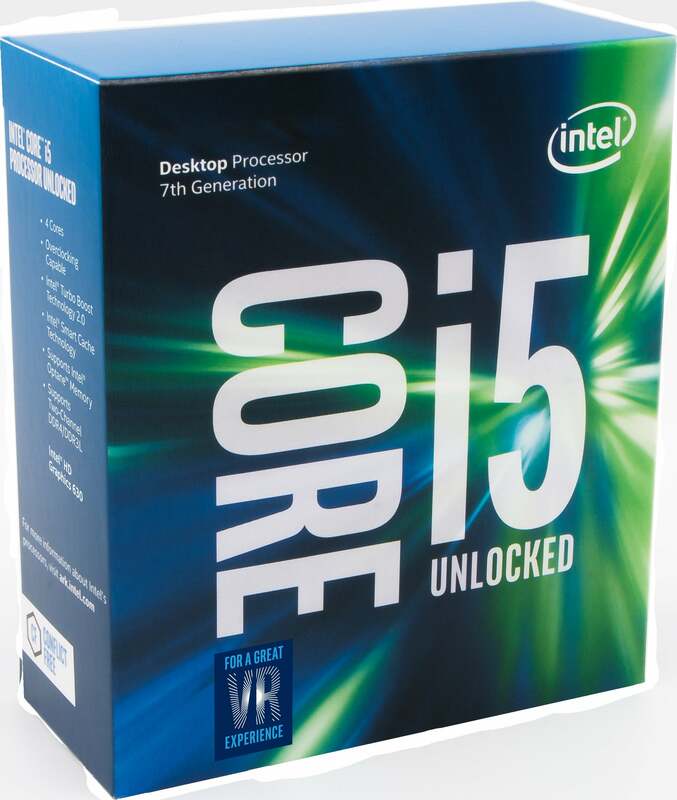 A retail box containing Intel’s Core i5 “Kaby Lake” chip. If Iris Plus isn’t enough, Intel’s also releasing three unlocked S-series processors: the i7-7700K, the i5-7600K, and the i3-7560K. The trio will have two new ways to be overclocked. The first is the ability to automatically tweak the base (“b”) clock as well as the clock multiplier. CPUs run on a base clock (typically 100MHz) as well as a user-adjustable multiplier. The automated Intel tool now allows an overclocker to adjust the base clock as well as the multiplier. That additional level of fine-grained control should assist in stable overclocking, Intel says. The second way, known as “AVX offset ratio,” actually dials down the clock speed when a computationally complex AVX instruction is executed, so the otherwise overclocked processor doesn’t overheat. It isn’t quite true to say that Kaby Lake was built explicitly for Optane, though this will be the first Intel architecture that supports the revolutionary new storage technology. Optane (Intel’s brand name for its 3D XPoint technology, co-developed with Micron) is essentially a replacement for an SSD, though an Optane module will first be slotted into a traditional DRAM slot. Intel’s shown how Optane can blow away traditional NAND flash memory, and leaked slides hint that Intel has Optane-based SSDs in the works, too. There are serious questions, however, about how Micron and Intel will market and ship Optane to PC makers, who practically demand multiple sources of products for the sake of competition. It’s also not clear what the price of Optane memory will be. 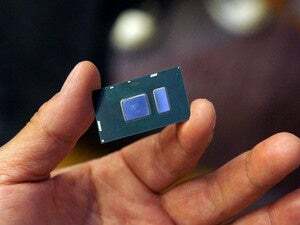 The only solid piece of info we have is that all of the new Intel 200-series chipsets will be Optane-ready, Intel executives said. They also said they expect to ship Optane in the first half of the year, and board builders and system builders will be able to plan ahead for the new memory technology. The bottom line, however, is that you won’t be able to buy Optane modules right when quad-core Kaby Lake systems launch. Here are what the desktop versions look like, as described by Intel. 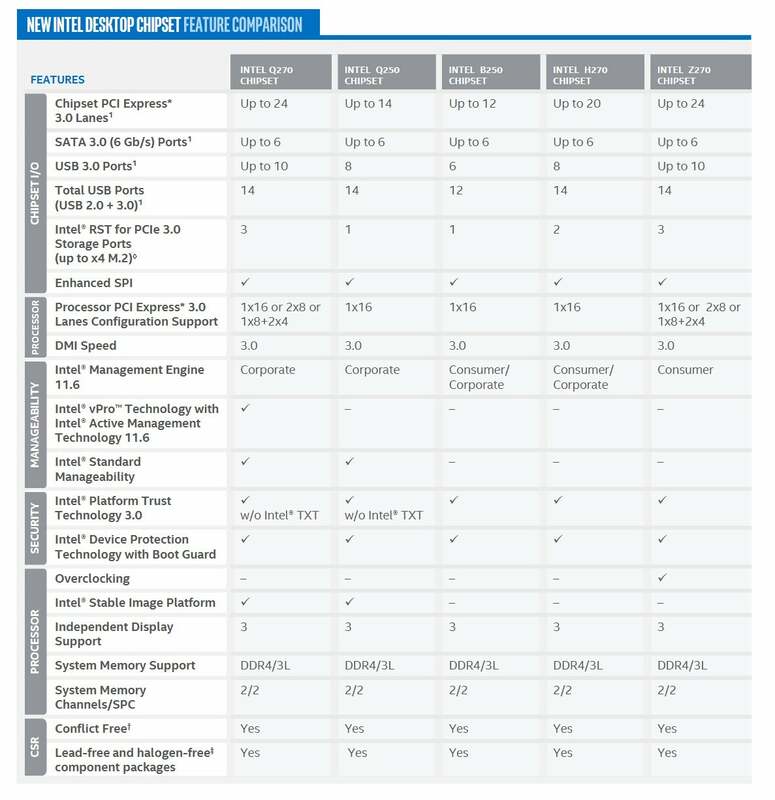 Note the increased number of PCI Express lanes compared to the Skylake generation. Remember Intel Authenticate? Intel began showing off the multi-factor authentication last January, combining PINs with biometric authentication and even the presence of an authenticated Bluetooth phone. (Here’s our hands-on with the Intel Authenticate technology.) Now, Intel says, Intel Authenticate is ready to go mainstream, at least on business PCs. A more important feature for consumers is Kaby Lake’s integrated video engine, which the company discussed in more detail at its August launch. Supporting the more popular 4K codecs within a dedicated video block within Kaby Lake will help minimize the load on the CPU. Intel hopes the rise of 4K video will be met by content creators and resellers like Netflix, as well as 4K services like Sony Pictures’ ULTRA, FandangoNow, and iQIYI, all expected to launch in 2017, Intel executives said. Next up: Extreme Edition chips, and...? With all the Kaby Lake news, we still haven’t heard anything about Intel’s Extreme Edition chips for the creme-de-la-creme of the overclocking world. Those usually arrive in the fall. In the meantime, one big question remains: How much will AMD’s Ryzen affect the competitive landscape, and how much will Intel alter its pricing scheme as a result? It appears Ryzen will have some impact, but Intel also seems prepared to shift the discussion to Optane. Improving the CPU is significant enough, but most PC enthusiasts have bought into the belief that an SSD is the best way to speed up PC performance overall. If Optane takes storage performance to an entirely new level, some might resist Ryzen’s siren call. But Optane would have to be a generational leap ahead, rather than—ahem—a flash in the pan.